LONG ISLAND, N.Y. – I spend far too much time during each vacation waiting in parking lots. Until Sunday, the parking lot had never been the destination. But I’m getting ahead of myself, because Tesla was first. I’d never heard of Nikola Tesla until David Bowie played him in 2006’s The Prestige. Tesla revolutionized electricity, but it’s Edison’s name we all know. Construction on Tesla’s Wardenclyffe Tower on Long Island began in 1901; the plain building has a red-brick tower topped with a weather vane, but over that in Wardenclyffe’s heyday was a giant, 187-foot telecommunications tower that was “intended for commercial transatlantic wireless telephony, broadcasting and to demonstrate the transmission of power without interconnecting wires,” according to Wikipedia. The money ran out. 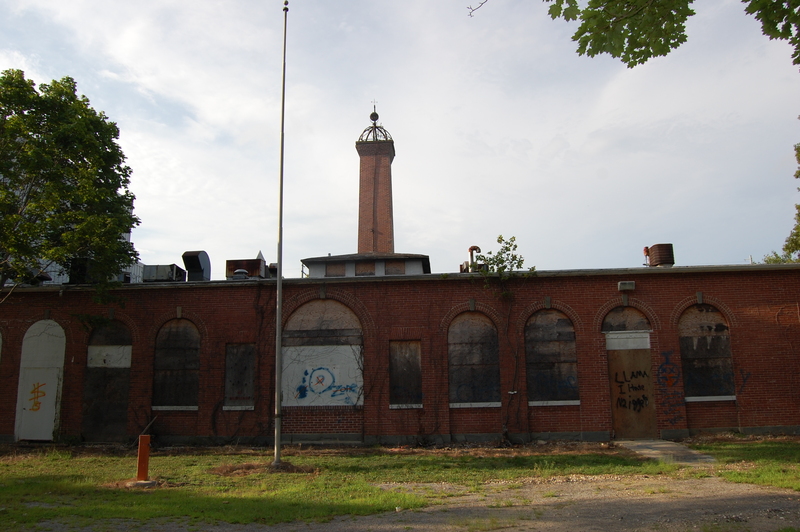 Wardenclyffe was vandalized. By 1915, Tesla no longer owned the land and two years later the radio tower was destroyed so it couldn’t be used as a landmark by enemy submarines. Various groups have tried to have Wardenclyffe designated a historic site and have tried to raise funds to fix up and maintain it. The building is on a quiet suburban street a few steps from a fire station, on Tesla St. It is covered in graffiti and overgrown with trees and weeds that make it nearly impossible to get a view of the building from the street. “Hayley,” our friend Zon called as I fruitlessly snapped shots through the fence. “Umn, there’s a hole here.” The hole in the fence was probably left by the taggers – it was plenty wide enough for us to walk through and snap several pics. The spray paint is depressing. Wardenclyffe would make an excellent radio or communications museum, or a grand community centre. Instead it’s rotting away and even the deer roaming the back yard can’t keep the vegetation at bay. We snuck back out of Wardenclyffe and headed down the highway to the Home Depot parking lot at Jericho Turnpike. It’s not your average suburban parking lot, you see – there’s a cemetery in the centre of it. Long Island is alive with ghosts, of radio towers and 19th-century farmers.